Black and white film processing and printing available by mail. Send your black and white film to us for professional quality developing, printing and scanning. We offer quick turn-around and quality that is 100% guaranteed. We can develop almost all types of black and white films including Kodak TMAX, Tri-X, Ilford Delta, HP5, FP4, Rollie, Fuji Acros, Adox, SFX, Infrared and many more. If you have a special film that you would like to have developed please let us know - we can probably develop it as well. It's easy to send your black and white film to us for developing - start by downloading and completing an order form, and then send it along with your film to us for developing. We'll get your black and white film developed and sent back quick. And, if you have any questions about our black and white film developing, please call or email and we'll be happy to help! Tip: Our film processing prices are set up so that you pay for the developing then add the price for prints, scans, or both if you would like. If you order both prints and scans from your 35mm, or medium format black and white film at the same time you'll get the discounted price of $4.99 per roll on scanning the roll. Black and white film processing prices. 4x6 prints at time of processing 30¢ ea. 4x6 prints- second set 15¢ ea. 5x7 prints at time of processing 75¢ ea. 4x5 or 5x5 prints at time of processing 60¢ ea. Did your b&w film not turn out? Get help here. • We ALWAYS return your negatives. • Turn around is one to two business days. • Return shipping starts at $4.95. • We use Kodak X-Tol b+w film developer. • Each picture is inspected for ideal contrast and density. • Push and pull processing is available at no extra charge. • All print and scan orders include an index print. • 35mm scan resolution is 2400x3600. • 120/220 scan resolution is 2400x3000 or 2400x2400. • Film scans are .jpg files, .tiff files on request. • Choose from glossy or matte, with borders or borderless. • Your negatives are carefully cut and protected in archival sleeves. • We can upload your b&w film scans to Dropbox if you prefer. 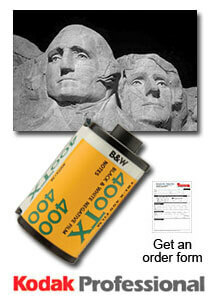 Send your black and white film to us for processing. Download an order form and send it in along with your film. We'll process your film and send it back fast. We accept most credit & debit cards as well as PayPal. better contrast, sharpness and lower grain, along with a perma-wash step to ensure maximum film longevity. You can read more about Kodak X-Tol developer here. Mail order film processing frequently asked questions.